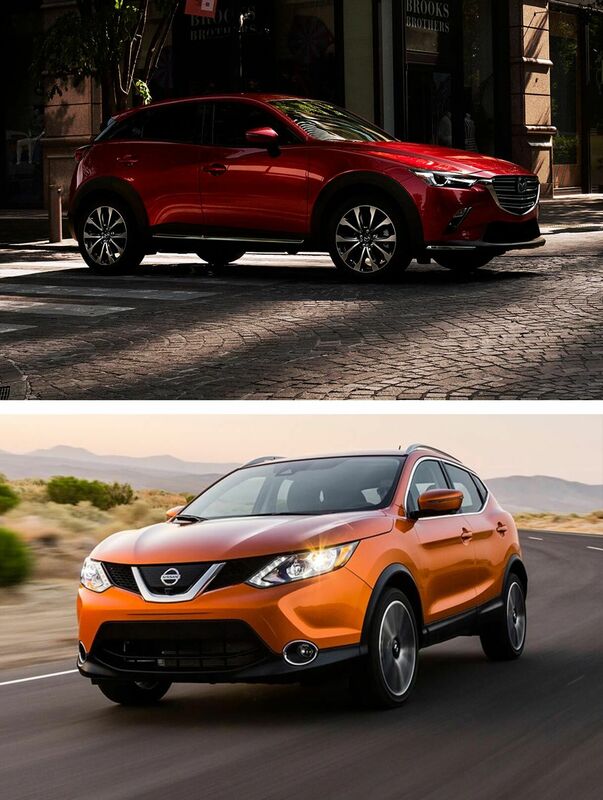 Look at the 2019 Mazda CX-3 parked next to the 2018 Nissan Rogue Sport and you’ll see an obvious difference. The 2019 CX-3 has a sleeker, sexier profile compared with the Rogue Sport’s meatier and more utilitarian look. Both have their own charms, but the Mazda CX-3 has a more exciting look that will turn more heads on the road. Both the 2019 Mazda CX-3 and the 2018 Nissan Rogue Sport are modestly sized SUVs that seat five people. The 2019 Mazda CX-3 comes in at 168 inches long, 70 inches wide, and 61 inches high. The 2018 Nissan Rogue Sport is four inches longer, two inches wider, and two inches taller. Despite those size differences, the two SUVs have comparable passenger space. Front-row passengers in the Mazda CX-3 will have 41.7 inches of leg room, 38 inches of head room, and 52 inches of hip room. That’s just about an inch less than leg room in the Nissan Rogue Sport and about an inch and a half less head room and hip room. Meanwhile, rear passengers in the Mazda CX-3 have 35 inches of leg room, which is about an inch and a half more than what’s offered in the Nissan Rogue Sport. You’ll notice the biggest sizing differences in the cargo space. The 2019 Mazda CX-3 offers 12.4 cubic feet of cargo space behind the rear seat, but if you fold down the seats, you get 44.5 cubic feet of space. The 2018 Nissan Rogue Sport offers 22.9 cubic feet of cargo space behind the rear space, but if you fold down the seats, you get 61.1 cubic feet of space. You’ll have plenty of seating space to be comfortable in both SUVs, as well as adequate cargo space, but there are a few differences that could add up, depending on your preferences and unique needs. There are a lot more differences to the interiors of these stylish SUVs than just the sizing. Each has its own style and its own lineup of comfort and convenience features. The 2019 Mazda CX-3 has a sophisticated interior with high-quality materials and comfortable seats. You’ll feel like you’re stepping into a more luxurious vehicle with a higher price tag. The infotainment system is connected to a 7-inch display, and Bluetooth streaming, speech to text, and smart phone connectivity are included. A heads-up display, push-button start, remote trunk release, a backup camera, voice-activated radio, and tinted glass are just a few of the other features included. You’ll love driving the 2019 Mazda CX-3. Meanwhile, the 2018 Nissan Rogue Sport has similar convenience features, yet it doesn’t have the same high-end feel to the interior. You won’t get anything more with interior features on the Rogue, but you will experience less with the interior quality. Not only does the 2019 Mazda CX-3 look sportier, but it drives that way, too. The all-new Mazda CX-3 comes standard with a 2.0-liter Inline4 engine that puts out 148 horsepower and 146 lb-ft of torque. The 2018 Nissan Rogue Sport comes with the same engine size and type, but it only puts out 141 horsepower and 147 lb-ft of torque. You’ll feel a little more oomph under the hood when you’re driving the CX-3, which will help you accelerate more quickly to better maneuver traffic and will make you feel more in control in uncertain conditions. The estimated fuel economy in the 2019 Mazda CX-3 is 29 mpg in the city and 34 mpg on the highway, which is great in an SUV. The estimated fuel economy in the 2018 Nissan Rogue Sport is 25 mpg in the city and 32 mpg on the highway. Not only will you get a bit more power behind the wheel with the new Mazda CX-3, but you’ll also save money overall on fuel. With everything you get with the 2019 Mazda CX-3, you might expect to pay a lot more money. However, its starting price is a low $20,390. Not only does it offer a lot more than the 2018 Nissan Rogue Sport and come in a more stylish package, but the Mazda CX-3 is also a lot cheaper. The 2018 Nissan Rogue Sport starts at $21,640. Of course, pricing goes up on each model as you move up the trim levels and get more features. You can also invest in optional packages to get additional features or a more powerful engine. Dealer offers and improved financing terms can make it easier for you to afford all the options you want. Both the 2019 Mazda CX-3 and the 2018 Nissan Rogue Sport have plenty to offer, but it’s clear that the new Mazda CX-3 is more stylish, has more features, and has a more powerful engine and better fuel economy. You’ll also pay much less for the Mazda CX-3. However, we encourage you to visit your local Mazda dealership to take a test drive of the new CX-3 and discover what makes it so great for yourself. You may be surprised at how smooth the handling is and how comfortable the interior. While you’re visiting the dealership, you can compare the trim levels to find the best option for you, and you can apply for financing offers to get the best deal that you can. The 2019 Mazda CX-3 should be hitting dealerships any time now, so call your local dealership to be alerted so you can be one of the first to take a test drive. Take advantage of deals to get the best price as one of the first buyers.